The list of incoming messages appears in the left panel of the dashboard, sorted by newest first. For each conversation, preview the latest message sent. The number of unread messages appears in green. The agent icon next to each conversation shows who it's assigned to or if it's unassigned. You can filter the list of active conversations by channel, status, or create a custom filter of your own. Click the dropdown menu next to the list of conversations. 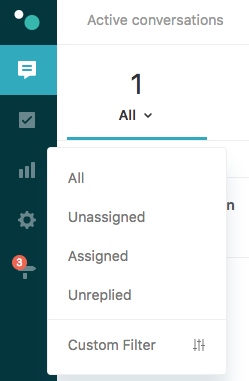 To filter by status alone, select All, Unassigned, Assigned, or Unreplied. Unassigned is the default value. To narrow your search further, select Custom Filter. In the first drop-down menu, select a conversation status (Unassigned, Assigned, or Replied). In the second drop-down menu, select Older than 1 hour or Newer than 1 hour to filter by time frame. Select All if you don't want to filter by time frame. 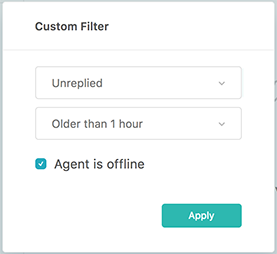 Select the Agent is offline check box to show only conversations assigned to agents who aren't currently online. 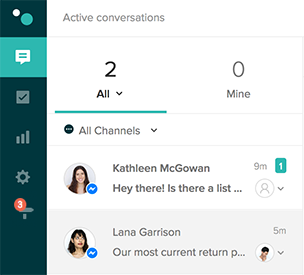 Click the active conversations ( ) dropdown menu next to All Channels. Select the profiles you want to filter by. 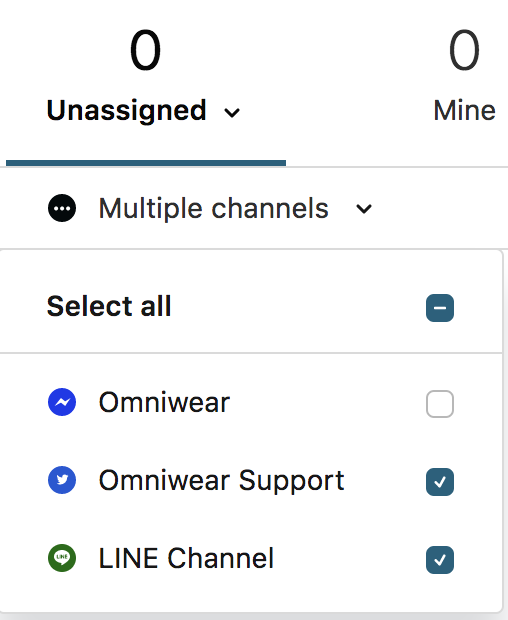 If you have not set up a channel or profile, see Adding channels. After a conversation is marked as done, it's moved out of the active conversations list. Click the checkmark icon ( ) in the sidebar.